Frames are processed through a single queue. All frames are placed in a common memory buffer. Frames are placed in a queue for the destination port. A port with a full memory buffer can cause frames for available ports to be delayed. Each switch port is statically assigned a buffer of equal size. 4. 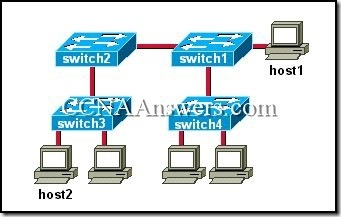 Why does a switch have higher throughput compared to a bridge? Switches create multiple broadcast domains. Refer to the graphic. Which point must be reached before a frame is forwarded when the switch is using store-and-forward mode? 7. Hubs are concerned with which PDU? Hubs operate at Layer 1 of the OSI model. They create separate collision domains. Signals are distributed through all ports. Layer 2 addresses are used to make decisions. They calculate the CRC for each frame received prior to forwarding. Bandwidth is shared among all connected users. 9. Which device provides segmentation within a single network? 10. Which of the following is a Layer 2 broadcast address? Refer to the graphic. 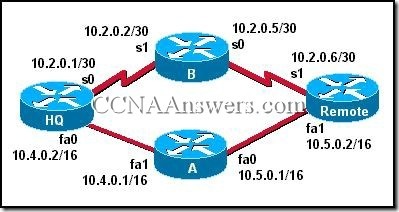 Which point in the frame must be reached before it is forwarded by a switch that is using fast-forward mode? 12. Which switching mode changes to store-and-forward mode after it detects a given number of errors? 13. Which form of buffering is used by bridges? 14. Where are switching tables stored in a Cisco LAN switch? They increase the number of collision domains. They decrease the number of collision domains. They increase the number of broadcast domains. They decrease the number of broadcast domains. They increase the amount of bandwidth available to users. They decrease the amount of bandwidth available to users. 16. Which of the following is used to build a switching table? It uses data compression algorithms to manage higher bandwidth interfaces. It is often used to provide high bandwidth uplinks for a number of lower bandwidth client interfaces. It provides connections between network segments that operate at different bandwidths. It uses cut-through forwarding when going from a lower bandwidth to a higher bandwidth interface. It is used to provide more bandwidth to network clients than to backbone or server links. It may require buffering frames before forwarding to the destination interface. 18. What does switch latency describe? The source MAC address and input interface pair are added to the bridging table. The destination MAC address and input interface pair are added to the bridging table. If no match to the destination MAC address is found in the bridging table, the frame is discarded. If no match to the destination MAC address is found in the bridging table, the frame is flooded out all other interfaces. If a match to the destination MAC address is found in the bridging table, the frame is forwarded out the associated interface. If a match to the source MAC address is found in the bridging table, the frame is forwarded to all ports. 20. Which attribute is used by a bridge to make forwarding decisions?